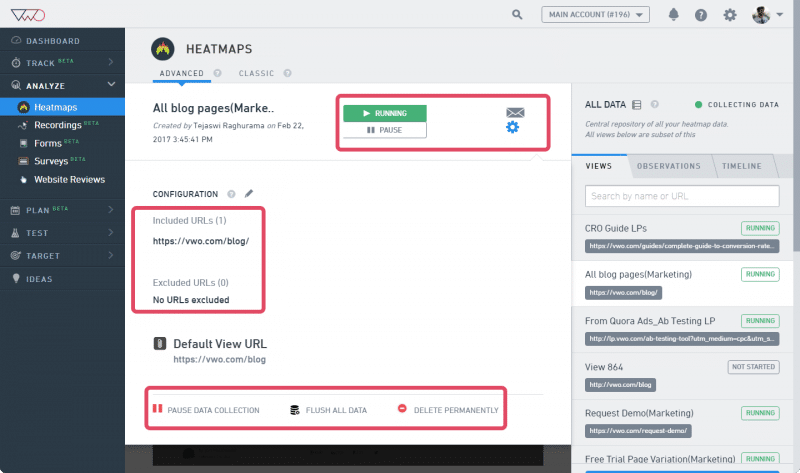 If you are using the Heatmaps feature for the first time, you must first enable VWO heatmaps to collect data for your website. When you enable the option, VWO automatically starts collecting data on all the pages that have VWO Smart Code. Under Analyze on the navigation bar, click Heatmaps. If you are using VWO heatmaps for the first time, click Enable Now. If not, continue working on the Heatmaps dashboard. Click the Classic tab to view all your previous heatmaps. 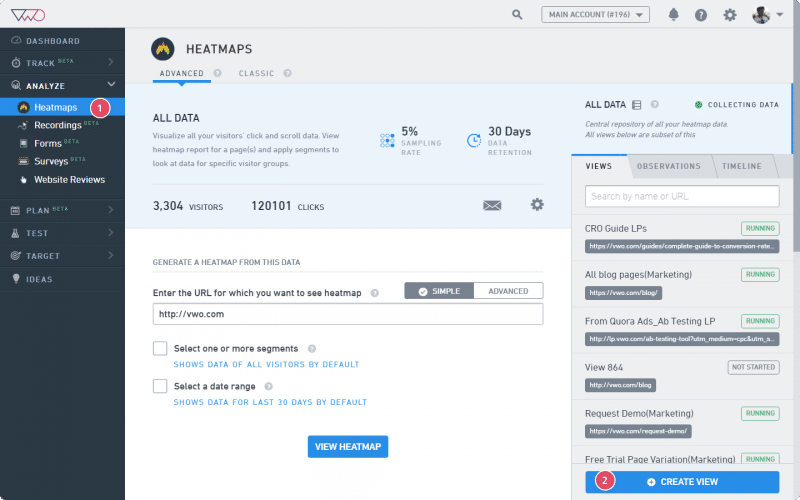 Based on your VWO subscription plan, the dashboard shows the total number of visitors, clicks, sampling rate, and data retention for your data. To use a default VWO segment, use the Segment Gallery option to select the visitor segment you want to target. To create your own custom segment and define conditions for that segment, click Custom. To learn more about creating custom segments, click here. To filter reports within a specific date range, select the Select a date range check box. Last 30 days: View reports of last 30 days from today. Last 7 days: View reports of last 7 days from today. You can create customized views to track activities of a specific visitor segment, and then save the view for later viewing. To create a new view, click Create View on the Heatmaps dashboard. To learn more on Views and how to create them, click here. To generate heatmaps for a webpage, specify the page URLs, and then define target visitor groups, if any. Click the Advanced tab next to the URL field to include or exclude URLs from the test. You can also use this tab to define advanced pattern-matching options to include either a broad URL with wildcard entries or a specific URL. Click the Settings gear icon to configure the URLs where you want to plot heatmap data. By default, the heatmap will run on all pages where VWO code is present. However, if you do not want to collect data from certain pages (such as the Contact Us page, which may not be important for the test), you can use the Exclude URLs option. To stop the heatmap, click Pause Data Collection. If you want to clear all existing data from the heatmap, click the Flush All Data option. VWO will stop collecting data for the views you have created on the URLs. Click the email icon to share the report.